This century, the energy sector has been dramatically changed by two “revolutions”: the German energy transition, Energiewende, focusing on heavy investment in renewables; and the rapid growth in shale gas production in the United States. Both have brought about benefits and challenges. By combining these benefits, a solution could be found to the problems of the intermittent nature of renewable energy production. Our blog series on Energiewende analyses Germany’s rapid transition from nuclear power to renewable sources of energy, and its successes and failures. Coal, electricity grid modernisation, local protests and seemingly high expenses emerge as problem points of the energy transition. Even though the costs of the energy transition have been huge, it has, at the same time, contributed to the creation of new markets, expertise, jobs and exports. Thanks to the energy transition, the rapidly evolved efficient production and distribution technologies for renewable energy have dramatically lowered the initial expenses of launching the use of renewable energy sources. Because of this, countries all over the world can now enhance their national energy security. In the US, shale gas has lowered the price of energy, reduced emissions by replacing coal, and increased energy self-sufficiency. The price of coal has dropped, and its consumption has increased in Europe. Germany’s energy transition, on the other hand, has substantially increased the use of renewables, but since nuclear power has been replaced with coal at the same time, emission levels have not fallen. The International Energy Outlook 2013 (IEO2013) reveals that global energy consumption will grow by 56 per cent by 2040. Much of this growth will occur in non-OECD countries, where demand is driven by strong economic growth. In these countries, the energy use may increase by 90 per cent. In OECD countries, on the other hand, the increase is 17 per cent. In terms of the introduction of renewable energy sources, the focus has already shifted to South East Asia, where the rapid increase in energy consumption has created new markets within the sector at a growing rate. The combined population of the countries leading the development – Thailand, Indonesia and the Philippines – is more than 400 million, which is only 20 per cent less than the overall population of the European Union as a whole. China will also invest almost 300 billion euros in renewable energy over the next five years as part of its objective to cut emissions. All of the countries mentioned above have rapidly growing populations in economies that are growing even faster. Thus, the financial opportunities offered by these changes and their impacts on climate change could be significant for the European population too. Businesses have strong faith in the future of renewable energy. East Asian countries, such as South Korea and China, are constantly enhancing their expertise in the green/cleantech industries. In Finland, ABB and Fortum, for example, have made major investments and are making important contributions to product development within the sector. Even though the competition within the sector is fierce, there is still plenty of business potential both in Finland and in the international market. 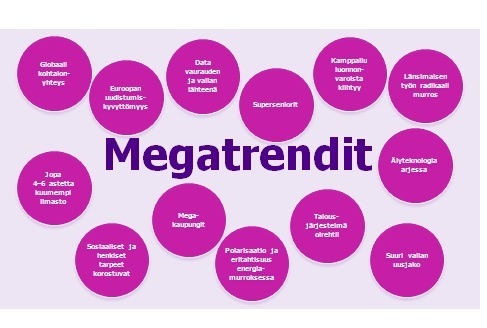 By making efforts to rapidly enhance its expertise and networks, Finland could also take advantage of the major business opportunities afforded by this great transformation. Currently, Finland is in the process of establishing an infrastructure for more extensive exploitation of natural gas. The EU wants to create a well-functioning internal market for natural gas. This will open up extremely interesting opportunities for Finland. If implemented, the terminals built for liquefied natural gas (LNG) could solve the problems of variable output associated with renewable energy. The production of renewable energy happens in bursts, which means that the output is not smooth. The periodic nature of production is a problem at hourly, daily and seasonal levels, because there must be as much energy available at all times as is needed to meet the demand. There are three factors that could contribute to finding a solution to the problem of periodic output: regulating power capacity to compensate for the intermittent production, energy storage and the capability of the system to accommodate the periodic oversupply of energy. So far, the problem of variable production has been largely one of regulating power capacity. Cost-efficient technologies for energy storage are under development, but, with the exception of pump storage stations with limited capacity, power systems still lack mechanisms for accommodating – i.e. storing – the periodic oversupply of energy. In other words, renewable energy produced in the summer cannot be used when the demand for energy is at its greatest in the winter, or when there is less sunshine or wind. According to experts, the best and the most flexible way of producing regulating power to balance solar and wind power is natural gas that can be used both in the industrial and the transport sector. It is mostly hydrogen energy, and its emissions are only half of those of coal. The problem of intermittent production could be solved by transforming carbon dioxide (CO2) and water (H2O) into methane (CH4) – or in more familiar terms natural gas – with the help of surplus renewable energy. In such a case, natural gas could serve as intermediate storage for energy. A well-functioning natural gas infrastructure would thus provide a platform for year-round use of solar and wind power with high security of supply and it could be taken into use immediately. A methane-based network with LNG stations, gas pipelines and combustion plants recycling carbon dioxide could thus facilitate the establishment of a sustainable gas economy in the long term. The circulation of carbon dioxide in power generation systems could be closed. In transport use, carbon dioxide will be emitted into the air in the future too, so a sustainable source of carbon is needed for the production of renewable methane. Naturally, the extraction of carbon dioxide from air is also possible, but it would evidently be more cost-efficient to transform bio-based renewable carbon dioxide into storable methane. For example, in kraft pulp production half of all wood coal is currently discharged into the air in the form of carbon dioxide. Pulp production capacity under Finnish control could annually produce 130 TWh of methane as a by-product. This is such a huge volume that just this alone could cover the needs of Finnish road and maritime transport and even air transport, if a natural gas-powered aircraft were to exist. The remaining volume would still be sufficient to cover the current annual consumption of natural gas in the industry and in heat and power production, which amounts to approximately 40 TWh. In his letter to the editor of the Finnish daily newspaper Helsingin Sanomat, the president of the Board of the Finnish Association for Nature Conservation, Risto Sulkava, stated that, in the future, it would be possible, by means of a methane economy, to make a stepless transfer from fossil to environmentally neutral fuels, from imports to self-sufficiency, and from a centralised to a decentralised energy system, while safeguarding the security of supply. In other words, the problems associated with intermittent production can be solved. Using modern technologies. Even as we speak. The question is, do we want to do it?